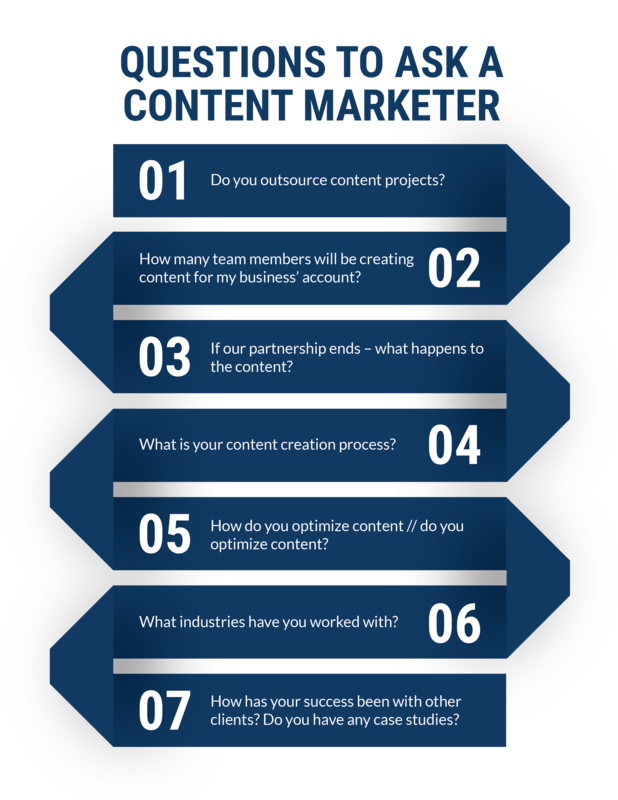 Do you outsource content projects? Does the agency you’re considering hiring outsource projects? It’s good to ask this question, especially if they’re putting on the façade that they’re creating unique and specific content backed by a strong strategy. We’re not saying that sometimes it can’t be done correctly. Maybe they have a long-term partnership with a specific freelancer and it’s someone they trust. Regardless, that information needs to be clear and communicated. How many team members will be creating content for my business’ account? When it comes to content, consistency is key. That means making sure your company’s tone and voice is present in every piece of writing produced. As a client, it’s important to know who is working on your account. Are they familiar with your brand? Are they comfortable writing in your voice? Whether it’s one point person or a larger team, it’s important that the people working on your products are educated and consistent. If our partnership ends – what happens to the content? Partnerships can end for a number of reasons, but it’s important to know that the progress you’ve made in your content marketing efforts aren’t thrown away. At Go Local Interactive, our clients own the content produced. They are able to do with it what they please, which means keeping the content even if a partnership has ended. However, not all agencies choose to take this approach. 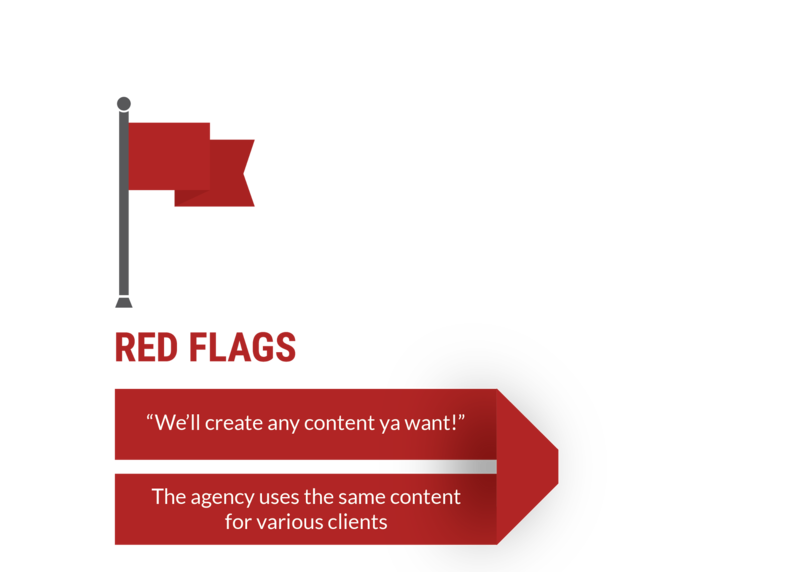 In some cases, the agency owns they content they produce for their clients. If a partnership ends, they retract the work they’ve produced for your company, leaving you back at square one. What is your content creation process? Quality content isn’t something you can always produce quickly. It’s important to have a process in place in order to stay ahead of the game and always maintain a consistent publishing schedule. Organization is also extremely important. If the agency you hire is unorganized, it will undoubtedly reflect poorly on your content marketing efforts, and you won’t get nearly the same results you expected. How do you optimize content/do you optimize content? Search Engine Optimization. The infamous “SEO”. There are a number of variables that can improve your business’ SEO and online presence – content being one of them. Google looks for rich, quality and unique content. If you feel like you’ve almost exhausted your list on how to improve your SEO, maybe it’s time to give your content a facelift. In the same way that content can be beneficial to your online presence, it can also be detrimental to your SEO efforts. Simply put, Google notices content that doesn’t incorporate SEO best practices. It knows when images you include don’t have alt text. Google is even able to pick up if your site has duplicate content. Yes, we’re looking at all of you sketchy content creators of the internet. Google knows. Looking for technical explanations of complex topics? It’s good to know if the agency you’re teaming up with will be able to fulfill your requests. If they aren’t experts in your industry, that’s OK. But they need to at least be willing to set aside time for in-depth research until everyone feels comfortable with the subject material. How has your success been with other clients? Do you have any case studies? An agency’s current and past clients hold a lot of information. Are they willing to refer the agency to other company’s they trust and respect? Do they have solid case studies that show the effectiveness of their programs? These questions can give insight into the credibility and expertise of an agency. You’re looking to a content marketing agency for a set of experts. It’s not your job to know what content is going to work for your needs – it’s theirs. Instead, seek out agencies that create campaigns based on a solid understanding of your company goals, rather than throwing content out there just to see what sticks. Because odds are, it won’t. And you’ll be left paying the price. The agency uses the same content for various clients. Agency uses a unique, strategic approach for creating content. The right agency will take the time to get to know you and your brand. They will not have a one-size-fits-all approach; rather, they’ll tailor their strategies to align with your company’s needs and goals. Their approach to your content marketing program will be specific only to your company and relevant to what your target audience cares about. Agency provides testimonials, or has been referred to you by a current client. Testimonials can hold a lot of weight in the hunt for an agency. While many agencies don’t like to give the names of their clients online, it’s worth asking them directly if they have any testimonials on hand to share. If a current client referred you to the agency, it’s a safe bet that they have been pleased with the services they’ve received. Agency has credibility – including awards and recognitions. While an agency might not share their client names on their website, they will and should share their awards and recognitions. By doing a simple branded search on Google you should be able to find press releases, social posts, and blog posts that share big agency news. Awards and recognitions add to a company’s credibility and presence in the marketing industry. 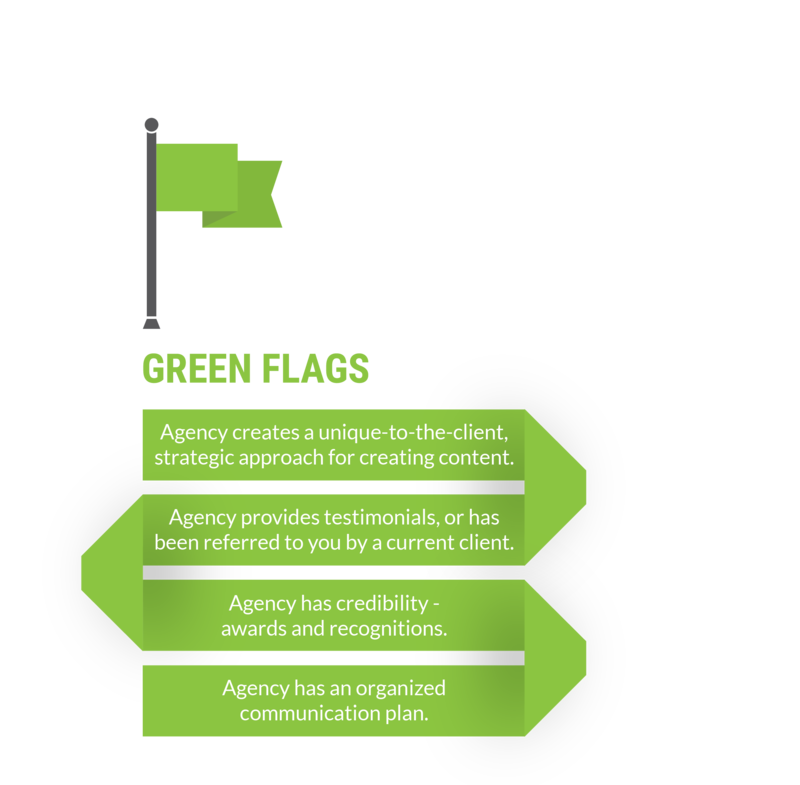 Agency has an organized communication plan. It’s a good sign when an agency has a clear content approval process and communication plan in place. Having a consistent schedule for approval sets expectations, limits miscommunication, and maintains good relationships between client and agency. If you’re ready to hit the ground running with your content marketing program, there’s no better agency to team up with than an organized one.